Bernie Sanders has many American’s in agreement that we need a change in how insurance works in the USA. Not everyone agrees with Bernie Sanders on how to make this happen. Our overly complicated system has been ruined by private interests which include insurers, hospitals, medical suppliers and drug companies who often charge prices that nobody can relate to. The USA has the highest healthcare costs in the world, and one illness can wipe you out financially; something that is unique in our system. The current systems complexity has many healthcare providers joining hospital systems or large practice groups to avoid being picked off by insurance carriers who work for their investors and stock holders, instead of you. Drug companies and large hospital systems also are centered on the bottom line as well. While everyone needs to earn a living, the profits and prices are often exorbitant. What about the poor patient? High deductibles and copayments combined with ever rising insurance premiums have employers either self insuring or moving from plan to plan, which affects many patients and their relationships to their doctors. Doctors who are in larger groups now have clout to ward off predatory insurance company behavior. Many are deciding to join large hospital or medical groups which offer some protection for their incomes, while making them an employee beholden to the organization they work for. Universal healthcare is an idea that has come and doctors, as well as their patients are adversely affected by the current environment. 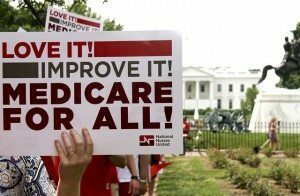 According to a recent NY Times article, moving to a single payer Medicare for all system may upend many jobs for not only insurance companies but also for companies who service the bureaucracy such as hospitals, specialists and many others who are part of the problem. Healthcare must be about the patient, primary care, non invasive holistic methods that are safe and effective and specialists when needed. We need to question the role of hospitals and drug companies and the prices that are charged. One insurer with one set of rules and a fair reimbursement scheme for all providers is good for patients, and providers alike. Removing high deductibles is good for the hospitals bottom line as well since they will no longer need to have so many people calling to get payments and care authorized, and will not have to chase after patients when their patient’s high deductible is subtracted from their insurance payments. Imagine coming home from the hospital and never getting a bill, or if you do get one, the cost is reasonable. What we have now is a system where person goes to their doctor, the doctor orders some lab tests and in many cases, the patient may have gotten a denial for either the doctor or the tests or both. If this hits close to home, its because this happens to everyone who is now insured by commercial insurance plans. American’s have never been told what Medicare in its current form would cost for the average person, although, deductibles are less than $200 for the year and they cover most services at 80%. Would you like to have coverage that is comprehensive and has a low entry cost? Most of us would. Seniors are happy with their Medicare coverage; not so much with their Medicare advantage plans from part C, which allows a private carrier to take your Medicare premium and you are now insured by them instead. When you listen to some of the current proposals for Medicare for all, all of a sudden, Medicare has to pay for dental and all sorts of other things. Medicare currently also covers out of network doctors but they do cap the maximum amount doctors can charge out of network. The designers of Medicare were wise enough to put this into the coverage to control costs, and disallow price gouging. Commercial insurance companies were not, and they instead have mostly eliminated out of network coverage which is unfair to those of us who are insured by them. Medicare in its current form works well other than the drug plan that needs to be able to negotiate prices. Why not just roll out Medicare to those 50 and older, the most expensive group to insure and see if the cost is competitive enough for the average person to want to buy it. This wouldhttps://www.nytimes.com/2019/03/23/health/private-health-insurance-medicare-for-all-bernie-sanders.html allow a transition that is orderly and does not shock the current system. If Medicare actually costs more than regular insurance, why would I buy Medicare? On the other hand, if Medicare is cheaper, or much cheaper, I am buying Medicare based on market forces. Medicare has certain advantages since it is a 50 state plan, and has millions of insured lives already. It is a public private partnership meaning that private companies administrate it for different regions of the country. Medicare can negotiate prices better than commercial insurers for hospital based care. The Medicare drug law must be amended to allow Medicare to negotiate drug prices which would reduce costs. Shouldn’t the healthcare consumer ultimately be able to buy in if they want? The truth is, healthcare is a tax and has always been, especially under Obamacare. Before that, we paid for indigent care though out state taxes. With Medical care, nobody escapes the costs. The NY Time recently weighed in with their opinion as per the practicality of a Medicare for all system. You can read about it by clicking here. Shouldn’t we be given a choice to buy in? Let the public decide. Some politicians have already suggested that the approach of allowing older Americans to buy into our current system is a great way to test how it works. We have an existing system that works, and you currently have to wait until you are 65 to find out how much less it can cost you. Maybe it is time that our politicians listen to us, instead of the big lobbyists with the large checkbooks who have a vested interest in making sure nothing changes. The truth is that nobody can afford this current system anymore. Medicare for all Americans would be a great first step. Unfortunately, it is only the beginning. The entire system needs to be reexamined however, we must start somewhere. Why not start here.